On our battlefield tour ‘The Forgotten Front’ we visit Givenchy and the site of the Red Dragon Crater. 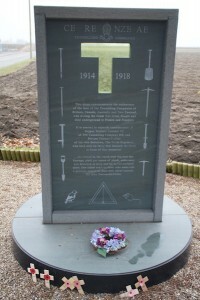 Like so many other battlefield sites, this area has seen the most selfless heroism along with so many tragic stories. 2.30am the German army blew a mine underneath the British front lines. Mining in World War One was a little like a game of cat and mouse. Tunnellers would continuously listen for the sound of enemy tunnels nearby. They knew that if the enemy blew a mine while they were in a tunnel, they would be buried alive as their tunnel collapsed. On June 22, 1916, Hackett and four other miners of 254 Tunnelling Company were 35ft underground heading towards enemy lines when a German mine blew in 25ft of the tunnel, cutting them off. They had no choice but to wait quietly in the hope of a rescue attempt by their comrades. On the battlefield, while Sapper Hackett’s group of tunnellers prayed for rescue, heavy fighting ensued above ground. The 2nd Battalion Royal Welch Fusiliers desperately to repel the enemy soldiers who attacked the British trenches. One officer described how there was ‘a colossal bang, and the whole area just rocked from one end to another. The men dashed to the parapet to defend their trenches and as the morning neared they had secured the area. However, dawn brought them some ghastly sights. The signs of the havoc were evident with the dead lying on the ground and men who had been partly buried on the crater’s slope. The rescue mission began. The battlefield story does not end there. The crater was named The Red Dragon Crater to mark the losses of the 2nd Battalion of the Royal Welch Fusiliers who fought so courageously to repel the enemy suffering heavy losses. B Company alone lost 54 men. Some of these had been buried in the explosion. In 1926 a farmer found the remains of some of them. Four of them were found together in a dug-out near the edge of the crater. 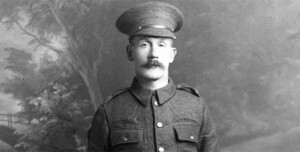 Lance Corporal Thomas Williams from Anglesey was identified by his pay book and letters in his pocket. Fred Vale from Birmingham was identified by his pay book and his disc. Bert Price from Newbridge on Wye had a pair of wire cutters with his name of the handle. James Wyllie, the youngest of the group at 19 had his pay book, a diary and some letters from home. They are buried side by side in Cabaret Rouge Cemetery. Two officers were also found. 2nd Lieutenant Trevor Allington Crosland had a gold disc. On the reverse side the words ‘Good Luck’ were engraved. He had a gold match case with his initials, TAC, the date 19 March 1916 and the words ‘Good Luck from Jack’. He had only been in France for six weeks when he met his death. The farmer also found the remains of Captain Owen Price-Edwards who was identified by his disc. Both officers are also buried in Cabaret Rouge Cemetery.